I have a love-hate relationship with large lecture classes. I love the efficiency of a good lecture for communicating information to a large audience, and, as an instructor, I love looking out at a sea of (hopefully) happy faces as students soak up that knowledge. But I’m less fond of the negative effect large lecture classes can have on student participation and engagement. I like to think I’ve seen a broad range of outcomes, both as an instructor and as a student myself. My first class when I was in college took place in a lecture hall with the capacity to hold 860 people, and not surprisingly, it was a standard lecture course with absolutely no student participation. It was pretty tempting to mentally check out at times since there was no outlet for students to participate or to engage beyond our own thoughts and note-taking activities. By contrast, my smallest class in college was 4 students (a great class on “Underground Paris” – what a cool topic!) and this one functioned like a true seminar where it was impossible to not be engaged every step of the way. 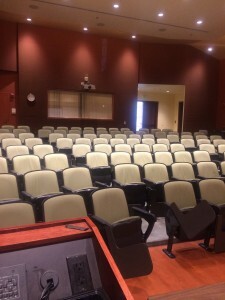 How instructors can harness the benefits of large lectures and keep students engaged along the way is an issue that grabbed my attention as soon as I started teaching. In graduate school, I had some great examples set for me by my mentors who found ways to encourage student participation even in rooms of 200 or 300 students. But even in these environments, it tended to be the same handful of students contributing to class discussion while everyone else stayed silent. It wasn’t too long into my time here at CI before I had the chance to teach one of our larger classes: Sociology 100: Introduction to Sociology, which is generally a class of 100 students. Of course, 100 is a lot less than 860, or even 200 or 300, but this is still a large class, and often the largest class that our students will have during their time at CI. Teaching SOC 100 gave me the opportunity to think about these issues in my own classroom and experiment with some solutions. Here’s what one of my classrooms looks like from the front of the room (instructor’s view! ), without all the happy student faces. We all know that technology plays a big role in contemporary society, in our lives, and in the lives of our students, and so it isn’t surprising that there are loads of tech tools that can be used in the classroom. One of my favorites is a student response system called “Top Hat.” Reading the words “student response system” may conjure up images of clickers for you, but Top Hat is so much more than that. Top Hat is a response system that students use via their own technology (laptop, tablet, smartphone, non-smart cell phone, etc.) that allows instructors to “hear” from every student in the room in a variety of ways. Ultimately, that’s my favorite thing about Top Hat…the equality is brings to classroom participation and its ability to include each of my 100 students, even if they are students who don’t feel comfortable participating verbally (which I always encourage!). Here are some of the cool things you can do with Top Hat. Comprehension check questions: Asking Top Hat questions to the class about concepts or other material from lectures or readings is probably the type of question I use most in the beginning of the semester. Early on in class, students are still getting to know my teaching style and tend to be new to the sociological way of thinking. So, I use Top Hat as a way to find out if they understand the course material and to help them practice questions they might see on tests. Sometimes I think I’m being clear about a particular topic and that they understand me, and then a sizeable number of students don’t get the question right! When this happens, it’s a valuable moment where we can touch base, go back, recover some material, and effectively get on the same page. Opinion questions: I don’t know about you, but my students love to share their opinions…However, oftentimes only a handful of students will do so in a class of 100. If I rely on verbal participation alone, then I tend to hear from the same dominant voices over and over again. Using Top Hat lets me hear from every student in the room. So, for example, I might ask my class if they think the “American Dream” is a reality as a way in to a lecture on social class and mobility. Students love to see the results and the distribution of their classmates’ opinions. I also like to ask students the same question after the lecture and see if/how their opinions change. Data interpretation questions: In the Sociology Program, we spend a lot of time working with our students so that they understand the science of sociology, and consequently this involves spending a lot of time talking about and looking at data – charts, graphs, tables, etc. Particularly in the beginning of the semester, after we go over a data display as a group, I pose a Top Hat question that checks students’ understandings of the data. This gives me the opportunity to see if students understand what I’m saying, and if not, to pose questions to the class about what they aren’t understanding. Here’s an example of that. 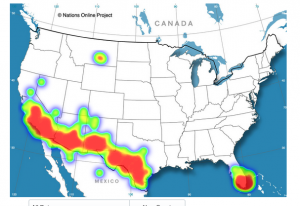 We looked at a spatial display of data that showed the geographical distribution of U.S. households that speak a language other than English at home, and then I used Top Hat to flash up a blank map and asked the students to click on the parts of the U.S. that had the highest percentages of households speaking other languages at home. You can see that the students correctly selected the Southwest border region and Florida, but also that some folks were a little off point in their choices. Group-work feedback tool: One thing I love to do with Top Hat is to put the students in groups of 3-4 to do an active learning exercise. Ideally, I’d like each group to report back to the class once they are done, but when you have 100 students, this could end up being very time consuming. So, I often use Top Hat as a group-reporting tool and ask one person from each group to tell me what their group came up with in the exercise. Then, I show the results to the class and ask for a few groups to verbally report back. I find this to be a really effective way to combine group work, active learning, and technology in a way that includes as many students as possible. So obviously I like Top Hat, but what do students think? Generally, they love it! Students tell me that they find the opportunity to practice test questions and check content comprehension in class really valuable. Students also tell me they like the “fun” questions I use to get discussion started because they like sharing their opinions and seeing how they fit in (or not) with those of their classmates. And finally, students tell me they like how I use Top Hat to break up chunks of lecture to help keep them interested. As an aside — I should say that in the beginning, I was worried that encouraging students to use technology in the classroom would lead to them checking out, surfing Facebook, or playing games rather than listening to lecture, but I have to say that this has just not been my experience…My visual assessment is that students are no less engaged than they were before I started using technology in the classroom. So, if you teach a large lecture class and are wondering about how to keep student engagement high, give Top Hat a try!